Some nights, you just want something that is both fool-proof and easy. All the rest of the nights, we’ll go to the extra trouble of making a white sauce from scratch, but tonight … we’re popping the tops off some soup cans. My family absolutely loves this dish. Gage is asking for seconds while still scooping the last bite in his little sauce-covered mouth. Brittney sits silently in a rapturous fog of tetrazzini bliss. Dave tells me TWICE how good it is, which, coming from a man of few words, really means something. This is comfort food at its best. While a real Italian might tell you it’s not the tetrazzini her grandmother used to make, a pretend Italian like me will tell you it’s just the sort of thing you need on a fall day when you want something quick and rib-sticking. Ready for the recipe? Here you go. Be sure to read the notes at the end, because this is a recipe with a lot of options. And you might notice … this is enough for TWO casseroles. That’s because there’s no sense in messing up the kitchen for just one dish. You may as well make a second for a friend or for your freezer. Cook spaghetti noodles according to directions, but remove and drain at least 2 minutes before you normally would, before al dente. The noodles will continue cooking in the oven and you don't want them mushy. While the water is boiling for the noodles in step one, drizzle a large frying pan with olive oil and heat for a few minutes. Add chicken breasts and cook for two minutes, then reduce heat to low and drizzle with about 1/2 cup of lemon or lime juice (whatever you have). Cover and cook another 3 minutes. Flip the chicken breasts over, add the minced garlic, cover again, and cook about 5 minutes or just until the pink os gone. Make sure the liquid doesn't dry up during this time or the garlic could burn. Also, you don't want to overcook the chicken breasts, because they're going to cook another 40 minutes in the oven. In a large bowl, mix the cream soups, half and half, water, Italian seasoning, salt and pepper, and 1 cup of the Parmesan cheese. Mix well. Drain the spaghetti noodles and add to the soup mixture. Stir well. Cut the chicken breasts into bite-sized pieces and add to the noodles and soup mixture. Place one-quarter of the spaghetti noodles in each dish, then sprinkle each with about 3/4 of the sharp cheese. Top each casserole with the remaining layer of noodles and sprinkle with the remaining parmesan and sharp cheese. 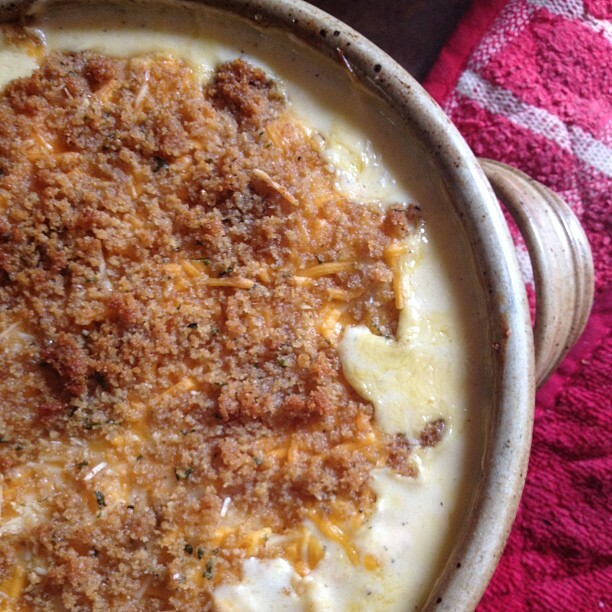 Bake @ 350 30-40 minutes or until breadcrumbs are golden and casserole is bubbly. CHICKEN: What is written here is the bare-bones method of cooking these chicken breasts. But if you have the time and inclination, marinate the breasts in a mixture of rice vinegar (about 1/2 cup), soy sauce (about 1/4 cup), lemon juice (about 1/4 cup), minced garlic, and a splash of fish sauce (optional, but it really does add good flavor). I like to leave mine in the fridge overnight and then cook according to the directions above. SOUPS: This is completely dependent on your own preference. You can use all cream of chicken or a combination of cream of chicken with either cream of mushroom or cream of celery. All are good. OPTIONAL ADD-ONS: If you have more time and want to get fancier, you can saute mushrooms, onions or shallots (or a combination) along with the chicken breasts. Yep, I definitely want to try this one soon! I have company arriving tonight for a long weekend, so I think I see the perfect opportunity! Thx for sharing!